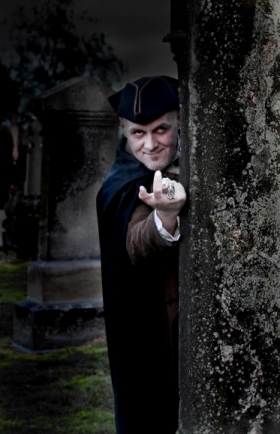 Stirling Ghostwalk :: Meet the Spooks! Stirling University alumnus David Kinnaird once considered a career in teaching or academia, but decided early on that dressing up in tights and scaring tourists was much more fun. He has been involved with the Stirling GhostWalk since the very first commercial summer shows in 1990, where he first made the professional acquaintance of the hangman, Jock Rankin. Theirs has been a long and productive relationship. David resurrected Master Rankin for tours of the (now sadly closed) Stirling Old Town Jail – Stirling’s first 5-Star visitor attraction - and still dons the grumblesome ghoul’s distinctive dusty tricorn titfer to lead one-man GhostWalk performances – being better known to many locals and visitors to the Old Town simply as ‘The Happy Hangman’. Jock has also featured in David’s books for The History Press – as he examined the origins of many of the most famous Stirling ghost stories in ‘Haunted Stirling’ and the Burgh’s bloody legacy of crime and punishment in ‘Auld Stirling Punishments’. Aside from writing every GhostWalk script since 1992 (and performing in most of them) David is a prolific writer and producer of ‘Living History’ performances and drama programmes, having developed comedy, drama and tour scripts, Murder Mysteries and other entertainments for Heritage Events and others companies at sites throughout Scotland. He occasionally writes and lectures on the history and folklore of Scotland, and leads daily Old Town Tours of historic sites in on the castle hill for Stirling Walking Tours, each summer. Over the past two summer seasons David has worked with Destination Stirling to re-establish the Old Town Jail - closed by Stirling Council in 2012 - as one of Stirling's key visitor attraction. Training actors, writing scripts and helping design displays and exhibits...and occasionally performing (in between GhostWalks and Old Town Tours), his job-title falls somewhere between Chief Warder and Artistic Director. David’s great passion is for Story, and he is as happy reading Batman as Burgess, Byron or Burns – high-brow or low - so long as there’s a good tale, or a catchy turn of phrase to be enjoyed. These eclectic tastes show in his scripts: a great believer in the old Gilbertian adage that you can ‘trick people into learning through laughter’, David’s scripts mix myth with history, the comic with the creepy. And, as the show has been running for nearly twenty-eight years, he must be doing something right! To make up for being nasty to people most of the year, David dons a red suit and white beard and serves as Santa each December! Having endured ten months of David’s ugly mug, Stirling GhostWalk audiences must be relieved when, in July and August each year, he is joined by his regular performing partner, Patricia Brannigan, for the summer season! Patricia trained in Contemporary Dance at Dundee College and Dance City/Newcastle College before gaining a first class Honours Degree in Creative Arts, which has led to a varied career as both a performer and teacher in many areas of the arts and entertainment. As a freelance artist, her diverse work experience includes acting, human statue, living history, pole-dancing, film work, and corporate entertainment for a range of companies and organisations. Pole-Dancing has been one of the most recent additions to her repertoire and has inspired her to try other aerial art forms such as trapeze, rope and silks. Patricia has worked as a lecturer on the Dance team at PASS (Performing Arts Studio Scotland) since 2007. Patricia Joined the Stirling GhostWalk in 1999, depicting, at one time or another every one of the Burgh’s famous colour-coordinated female phantoms (the Green, Blue, Black and Pink Ladies). A versatile performer she’s equally at home playing the troubled Countess Mar, the Queen of the Fairies, Tibbie Cawker (long suffering spouse of the Happy Hangman) and the fan-favourite 17th-century witch, Mad Bessie Stivenson. 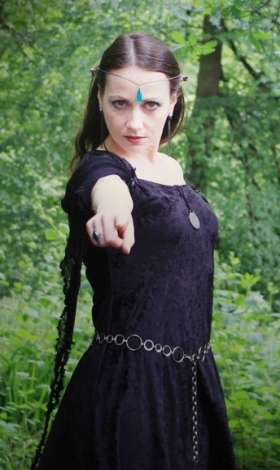 A great fan or horror and fantast fictions and folklore, Patricia co-wrote the 2003 ‘Vampyres: The Hunt’ Hallowe’en GhostWalk with David, and has worked with him on many other projects at sites ranging from Alloa Tower and Stirling Castle...to Santa’s Grotto!